When I was perhaps three years old and lively, my mother returned to teaching grades K–8 in a one-room schoolhouse just north of our house in Augusta, Maine, known as the White Schoolhouse. Lacking daycare at the time, she took me with her most days, and I learned the Palmer method of cursive handwriting long before I learned to sit still. I didn’t realize until much later that the school had been a point of contention between my great-great-great-great-grandfather Read and the City’s school board. George Read (1759–1848), a veteran of the Revolutionary War, was not only a staunch patriot who refused to whitewash his chimneys in the British manner, he was a no-nonsense, common-sense advocate of education. But in 1830, when the Augusta School Board decided to build a small schoolhouse a half mile north of George’s home, he strenuously objected. The site, he said, was on a knoll, too exposed to the weather and open to the wind, too uncomfortable for children, and far too expensive to heat. The city didn’t listen, and neither did George. He built his own school and ran it at his own expense. In 1830, George established a trust which provided a plot of land in his field just north of his house, and about half a mile south of the city’s school, “for the purpose of a school for the use and benefit of the children belonging to families who for the time being reside within the limits herein after described” (essentially those on what is now West River Road). George’s school was called the Red Schoolhouse for its red painted shingles, but it was also known as the Read Free School. George’s descendants, including my father and his siblings, as well as the children in the adjacent neighborhood, attended the Red Schoolhouse. The original trustees oversaw the school’s budget, a job which eventually fell to my great-great-grandfather Charles Otis Cony (1836–1924). 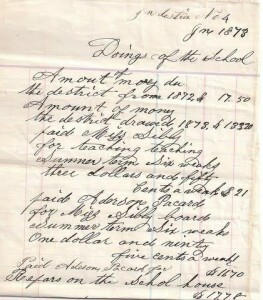 Entitled “Doings of the School, June 1873,” his accounts detail the $40 paid to Miss Sibly for teaching an eight-week winter term (she received only $3.50 per week for the six-week summer term), along with the cost of the wood used to heat the building (one and a half cords, sawed and delivered: $8.50). Time was not kind to the Red Schoolhouse. Sometime after the 1930s it fell into disrepair from lack of use. By about 1950 it was gone, the area once again a hay field, and currently populated by cabbages and corn. The city, however, kept the school on the hill, known as the White Schoolhouse for its painted clapboards, open to all local students who were taught by Mrs. Jessie White. (Mrs. White boarded at our house during the week when school was in session. My mother, Eleanor McLeod Church [1911-2005], succeeded her as teacher.) We used that hill for sledding during recesses while my mother stood watch for the very occasional passing car. 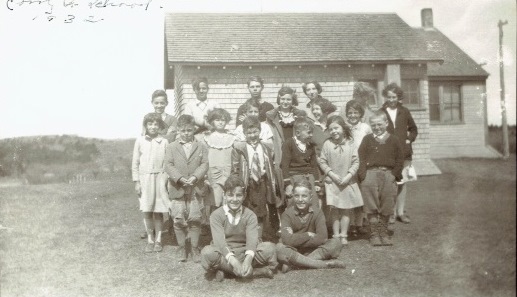 A “cloak room” was just inside the door, and a wood stove helped to heat the classroom. Wood and iron desks were bolted to the floor, the chalkboards were black not green, and neighborhood pets came to visit their student owners without Teacher’s permission. The school was closed about 1954, one of the last one-room schoolhouses in Augusta. While the Red Schoolhouse disappeared completely, the White Schoolhouse is now a machine shop, a neighborhood multi-generational gathering place for business, coffee, news, and friendly dogs snuggling up to a wood stove. Maybe it hasn’t changed that much after all. I enjoyed your remembrance of the li’l ole one roomer. I went to a little white one roomer in West Gorham, Maine until about 1952 when it was closed. It was just like the one you described. That must have been a standard design. The were two, one-holers, one for the girls, one for the boys. To get to them one had to traverse about 10 feet of lattice-enclosed runway from the back door of the school to the holer. Believe me, one had to really have to go to go out there during the winter. The winter wind whistled through that sieved latticework like swiss cheese. Of course you had to don again the winter clothing now hanging in the coat closet. Back in those days, the contents of the holers were neither treated nor removed. So once the winter winds abated and the early warm days of spring arrived, so did the overwhelming pungent odor of months and years past. I had all but forgotten all this so thanks for reminding me! 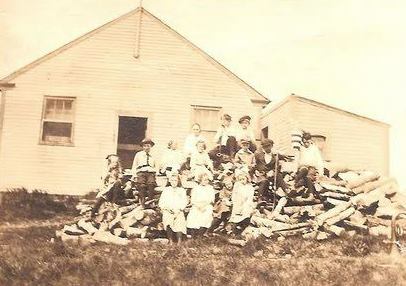 Two of my aunts taught in one-room schoolhouses in the teens in Clearfield County PA. One was the Aurand School! The building was still standing in the 1970s, when I visited it. 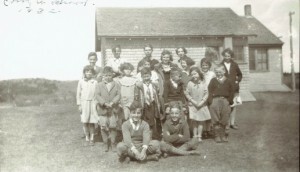 In the early 1920’s, my mother lived in Cheshire, MA and went to a one room school. When she told us about it, I almost didn’t believe her. Unfortunately like the Red Schoolhouse it no longer exists. I love reading your articles–they’re so close-to-home for me. In the 1970s, one of my sisters and her family went hunting for that school, which the rest of us assumed was gone. They found it, with a lot of help from elderly neighbors who’d heard the stories. It, too, was being used as a machine shop. 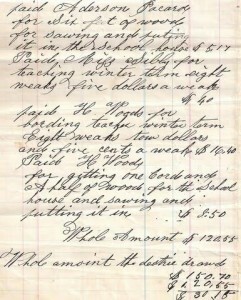 The original blackboards were still there, being used to keep track of jobs and orders. It’s wonderful to have photographs of the school, fifty years apart. In the early 1950’s I attended a one-room red brick school in Carlisle, MA. There was a small enterance room with wooden pegs lining both side-walls for us to hang our coats. There was one teacher for two grades, seventh and eighth. There were eighteen in the seventh grade which was the largest class at the time and eleven students in the eighth grade [up from nine the previous year]. There was a second red-brick school about a mile and a half from the center of town which was abandoned after seeing use as a chicken coop. The door was missing and when it rained or snowed, we waited inside for the bus. Do you remember your teacher’s name? My mother was a teacher in Carlisle, MA in 1950. My Teacher was Mr. O”Riley at the red brick school and Mr. Taylor at the four-room school. The fourth and fifth grades attended school in a room on the first floor of the Unitarian church, a beautiful, classic New England white church. Did you attend school at Carlisle? No I did not attend school at Carlisle. I was trying to locate the school in Carlisle where my mother taught in 1950. Thank you for replying. Where was the four-room school located, right near the red brick school or towards the outskirts of town? I know of about 3 buildings in Carlisle which I think could have been that four-room one. The four room school was to the right of the brick schoolhouse with some trees and space for children to play between them. So that’s the Highland building, then. I had grades 4 and 5 there. It is no longer a part of the school per se, but in a state of flux as the town tries to find a good use for it. The red brick school which we call “The Brick Building” was both library and later an arts center in my school days in the early 70’s, and still serves various functions. My mother and grandmother taught 6 or in some cases 8 grades in a one-room schools and my mother was my teacher in my 2nd & 3rd grade. I don’t recommend that to anyone. You are the example (discipline-wise) for the whole school. Those were the good old days, sort of. Kids now don’t have any idea the way things used to be. I would love to know where the white schoolhouse is located. I’ve been documenting one-room schoolhouses (whatever they’ve been renovated into) for 2 years and have pictures of over 250! There are so many stories behind those buildings and I’ve enjoyed this project. If anyone wants to share where there might be some of these schools “hiding”, I’d love to know. This was a great article! 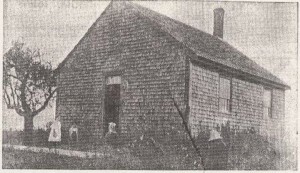 There is a white school building at Solon, Maine, south of the Old Meeting House on Meetinghouse road or possibly Rowell Mountain Road. My mother taught in one room school houses before she married my father. In Etna, No.Dixmont and a few other places. At that time you only had to have more education than your students. Her father taught at one time for a term at No.Dixmont. Was interested in seeing that Augusta had one room school houses. I worked in Augusta for many yrs. I posted the Red and White Schoolhouses thread on our local news list ‘cityinthewoods’. 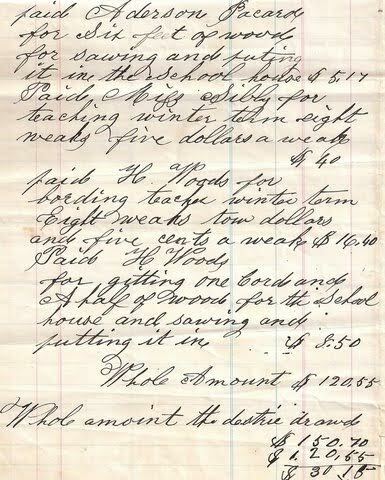 Subject: [cityinthewoods] Re: The Red and White Schoolhouses. Interesting comments. We’ve been doing a history e-newsletter about FRS, which has been full of interesting stories. I hadn’t heard of public school being held at the First Religious Society. I’m assuming it was Union Hall rather than the ground level where the former Red Balloon preschool was for decades. Carlisle’s population rose quickly in the 1950s. In 1957 the first Spalding School was constructed. The ground floor also served as Town Hall. An unusual combination of church and state within the same building.